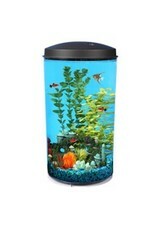 Aquaria (D) AP 6 GAL 360 LED W/SUPERCLEAN 10 FILTER - Rick's Pet Stores Inc. Compact and stylish, this beautiful desktop aquarium comes with an energy efficient 4-color LED light; emitting dazzling colors of white, blue, green and red along with a wide range of 10 color combinations and blending light effects that really brings your aquarium to life! 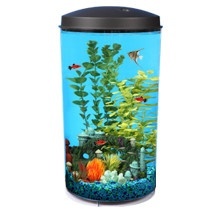 Includes API PERFECT START, a complete start-up program, that allows immediate addition of fish in a new freshwater aquarium, instantly providing a safe and healthy environment for your fish. Everything you need in order to set up and establish a successful aquarium. This aquarium and its filter are designed for easy set up and easy maintenance. Ideal for beginners. RECOMMENDED FOR: Tropical Fish; betta, zebra danios, swordtails, platies, mollies, gouramis, white clouds, tetras, corydoras, algae eaters, and barbs. INCLUDED IN THIS AQUARIUM: API PERFECT START: a complete and easy-to-use start-up program to successfully start your aquarium. Learn more. API SUPERCLEAN 10 Internal Power Filter: 45gph flow rate. API® CRYSTAL BIO-CHEM ZORB 10 cartridge: removes debris, odors and discoloration. LED Lighting: 4 Colors with 10 Blending Color Combinations. Free sample of API TROPICAL Flakes Food FEATURES: Tank Capacity: 6 gallons Energy Efficient LED Lighting with10 different color combinations and blending light effects brightly illuminates tank inhabitants without the cost and heat transference of other conventional aquarium lighting. SUPERCLEAN 10 INTERNAL FILTER, easy to use, makes aquarium water crystal clear. Impact resistant acrylic with seamless construction provides panoramic viewing. Unique feeding port allows for easy feeding without removing top. (Heater not included).